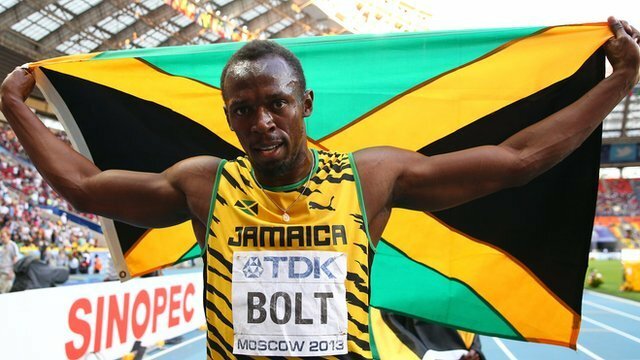 Usain Bolt defended his 200 m title with ease and took his tally of World Championship gold medals to seven. The Jamaican set a world leading time of 19.66 seconds at the World Atheltics in Moscow to secure his third successive world title in the event. Usain Bolt’s compatriot Warren Weir clinched silver with a personal best 19.79 while America’s Curtis Mitchell (20.04) took bronze by a hundredth of a second. His winning time was nearly five tenths slower than his personal best, the world record time of 19.19 he set in Berlin, and the slowest of his gold-medal wins over the distance. But with Tyson Gay absent through suspension and his compatriot Johan Blake injured, Usain Bolt did not have to produce a vintage display to secure the result the vociferous sell-out crowd in the Luzhniki Stadium expected. By the time the world record holder celebrates his 27th birthday on Wednesday, he could see his name alongside Americans Carl Lewis, Michael Johnson and Allyson Felix as the most decorated gold medallist in the championships’ history. The speed of Usain Bolt’s progress to the top of that list of high achievers depends on Sunday’s 4×100 m sprint relay final.